The M7 arriving at exactly the time shown on the app. You know that feeling when you're waiting for a very long time for a subway or a bus, usually on a weekend or late in the evening, and you just become certain that the MTA has failed you? And as each second passes, taking a cab becomes more and more attractive? The worst is when you keep waiting past the point of Should I just take a cab? and pass into I've waited too long now -- if I take a cab now, I'll see the bus/train pull up and pass my cab, so you just keep waiting, and yet, it still doesn't come. 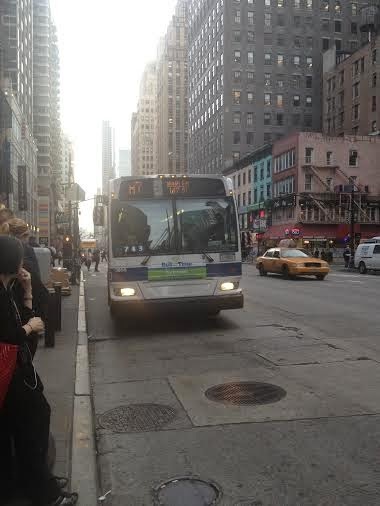 A few weeks ago, I was at the bus stop near Hunter College waiting for the M66 to take me across the park. It was already dark, so walking through the park was not an option I'd consider, but I was really exhausted, and I just wanted to be home. That particular stop is actually easy to judge the bus waiting time, because 20-30 people always congregate by the time a bus shows up, so if one arrives to see only one or two people already waiting, it's clear the bus won't come for quite some time. On that night, there were about 15 people waiting with me, but I was running out of steam, and considering hailing a cab anyway. All of a sudden, one of the Hunter students waiting announced to the assembled group, "The bus is at 2nd Avenue." For those outside of New York, 2nd Avenue is two avenue blocks away from this stop, which is far enough away that a bus is not visible, but just two stops from where we patiently waited. I wondered: How does she know that the bus is so close? Is she correct? Turns out she was, because the crosstown bus arrived a short while later, and as we climbed aboard, I thought about a rumor I had heard that there is now an app to know where your bus is in real time. For a couple years now, many of the subway stops have been outfitted with boards that let strap hangers know how many minutes away their train is from that station. Unlike D.C., not all the stations have these boards yet, but they are so helpful in the stations that do have them. It's amazing to be able to tell at a glance if one should hop on the local that's pulling into the station, or wait a couple minutes because the express is on its way. While there are no similar boards at bus stops, there are multiple apps to tell those waiting for a bus how far away the next one is from her stop. After that day at Hunter, I downloaded and tried out a few, and the two I like the best are BusBus NYC, and MTA Bus Time. BusBus NYC (at left) shows all of the nearby buses, so it's very helpful if one can take multiple buses to get to her destination. The only trouble is that, in my experience, the live map is off by about two blocks for each bus -- they tend to be further along their routes than the app shows. Still, knowing this, it can be very helpful to determine whether waiting for the bus that goes exactly where needed is worth it, or if it's best to board a different route that will end up close enough. If one is waiting for a specific bus, MTA Bus Time (at right) is the perfect app because it is incredibly accurate. Recently, I was waiting for a very long time for the M7. Eventually, I saw on the app that two M7's were neck in neck, inching their way towards our stop. They both seemed to get stuck at 34th Street for quite some time, and during that time, a couple people waiting at our stop gave up and hailed cabs. When the first M7 arrived, it was packed full to the gills, so I trusted the app and chose not to board that bus, figuring the second bus would not be as full. Seconds later, the second M7 pulled up, and when I boarded, I had my choice of seats. Not only did the app keep me from giving up and paying for a cab, but I also got a heads up that there would probably be seats available if I waited just a minute longer! Now I am a devoted fan of checking these apps while waiting for a bus. It's really wonderful to know if I have time to grab a coffee, or if I should take a cab, or if I should rush down the block to catch the bus. The subway boards and these apps could be the best additions to the MTA I've ever seen!